Our leadership and management training courses help ensure your stars are always ready to lead and inspire, manage change, foster diversity, and build productive and skilled teams. This module clarifies the concepts of management and leadership. It discusses management and leadership characteristics and behaviors found in effective managers and provides an overview of the many roles that effective managers fulfill. This module describes how to effectively appraise employee performance for the overall purpose of improving productivity. It addresses evaluating performance on an ongoing basis as well as conducting formal periodic reviews. 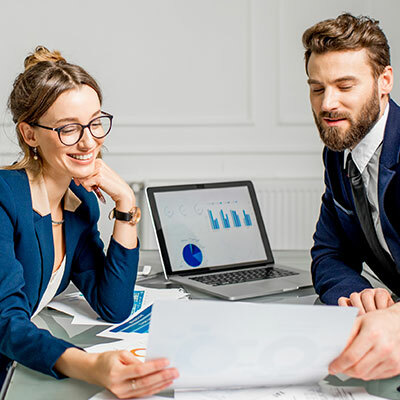 Since the success of district managers depends upon the success of their sales team, they coordinate recruiting activities with Human Resources. They should become as involved as the company allows when healthcare sales professionals who will be working in their districts are being recruited. Coaching and mentoring are central to successful workforce management. When used well, these processes lead to optimum performance outcomes and employee satisfaction. This module distinguishes these two important roles while focusing mainly on the coaching process. This module describes the following elements involved in effective employee coaching: providing direction for employee development, providing employee support, giving and receiving feedback, listening effectively, and communicating on a personal level. This module focuses on the role of district managers in working effectively with sales and other departments within the company and possibly outside the company, such as co-promote partners. This module describes various communication methods of communication from the more traditional memos and progress reports to contemporary methods that make communication with geographically dispersed members or virtual teams possible. These include e-mail, teleconferencing, videoconferencing, web conferencing, computerized discussion groups and online meetings, groupware, and other types of collaborative software. This module focuses on how to plan for, run, and follow up a team meeting, as well as what causes conflicts among team members and how to resolve them. The business plans of healthcare sales professionals represent cooperative efforts between the sales professional and district manager, who guides the sales professional in plan development, approves the plan, and monitors its implementation. In addition, district managers must write their own plans. This module discusses the content and process for creating both types of plans. This module explores different approaches to decision making and considers the factors that influence the extent to which employees should be part of the decision-making process. This module describes how to develop teams by understanding and applying the Tuckman model, which describes the stages of team evolution. Then, it explains how to successfully manage virtual teams. It also explains how to assign project responsibilities throughout the stages of team development and concludes by describing how team leaders and members can make effective decisions. This module looks at how successful managers promote an environment for effective communication and discusses specific avenues of communication, including business writing and e-mail, meetings, and presentations. This module focuses on facilitating formal group or district meetings. It begins with discussion of the district manager's roles regarding planning meetings and then describes the characteristics of successful face-to-face district meetings. This module describes the manager's role in developing an applicant pool by defining the open position and recruiting candidates. It also addresses some common interview problems and describes how to effectively prepare for, conduct, and gather information during interviews. The module concludes by describing how to evaluate information obtained during interviews and discussing legal considerations related to making a hiring decision. This module discusses when teams are most useful and describes how they are developed and managed for maximum effectiveness. This module discusses how managers make good hiring decisions and describes the ways in which they retain high performers, for example, through employee empowerment and effective delegation. This module explores problem solving, which is a common task for managers. It distinguishes formal from informal problem solving, looks at how groups can be used to solve problems, and considers how to successfully negotiate conflict when it occurs in the problem-solving process. This module begins by characterizing leadership and then discusses leadership behaviors and the ways in which leadership skills can be assessed. It concludes with a description of leading theories and models of leadership. This module examines management approaches that move an organization away from a hierarchical or "top down" style toward a style that tends to engage all employees in the responsibility of providing high-quality products and services. The models discussed include horizontal management, matrix management, learning organizations, and complex adaptive systems. This module describes several models that can be useful for understanding and managing change. It also explores strategies for championing change within an organization. This module describes a model for managing change, including the role of district managers during the various phases of change. Then, it discusses how district managers can help manage change related to some specific internal and external factors, including mergers and acquisitions, the managed care environment, evolving practices, and pressures to make healthcare products more accessible to patients. This module focuses on workplace diversity?differences arising from influences such as culture, gender, age, socioeconomic status, cognitive styles and physical and mental abilities. It offers tools for better understanding the nature of such differences and describes the issues managers face in improving communication in a diverse workforce. It also explains how communication that is sensitive to diversity can enhance an organization?s ability to work effectively in a global market. This module describes three paradigms--the discrimination-and-fairness paradigm, the access-and-legitimacy paradigm, and the emerging paradigm, which connects diversity to work perspectives. It concludes with additional suggestions for managing cultural diversity and tips for managing employees of different age groups. This module discusses the steps that contribute to a productive planning process and looks at planning in the context of three important management skills: managing projects, managing resources, and managing change in the workplace. This module focuses on three important resources available to district managers' time, finances, and technology/automation. This module discusses the benefits of appraising performance, describes the rating systems commonly used, and offers suggestions for planning and conducting appraisal meetings. This collection of micro lessons is designed to provide you with quick-hit, bite-sized pieces of learning related to leadership. Topics include: coaching and motivating employees, supervising employees, fostering diversity, manging and advocating change, leading teams, and conflict management. This module describes how to identify what motivates individual employees and how different motivational tools can be used to maximize performance. It also lists some employee issues that necessitate counseling and explains the counseling skills required. This module describes the district manager's role in using tangible motivators to reward positive results. It discusses the varied factors that motivate individuals and concludes with basic guidelines for motivating others. This module provides an overview of sales and management competencies. It begins with a review of important sales competencies. It then points out the differences and similarities between competencies companies expect of their healthcare sales professionals and those they expect of their district managers. This module discusses how to screen and select the best candidates for the healthcare sales professional position. Screening involves reviewing résumés, conducting interviews, and checking references and other related information to select the most qualified candidate who will work effectively with other members of the sales team. This module looks at the important skills of time and priority management, delegation, and stress management. It also explores how managers keep growing and learning from their experiences. This module focuses on setting goals and objectives with employees to obtain better performance results. Specifically, it describes how to write appropriate goals and objectives, how to translate objectives into action plans that contain specific milestones, and how to periodically assess progress made. This module describes how to effectively supervise employees by giving assignments and delegating tasks; setting goals, standards, and expectations; adopting the appropriate leadership style for the situation; monitoring progress; reviewing completed work and providing feedback; and making decisions that solve problems. This module discusses how effective managers focus on the supervisory aspect of their job by building productive relationships with employees, managing performance, measuring performance, and following up with appropriate actions. This module describes district managers' responsibilities during the stages of team development and how managers can create effective working environments. It also discusses territory alignment and deployment of the sales professionals who make up district teams. It concludes with a discussion of how district managers can empower their teams. This module discusses several leadership theories and the research that helps explain their underlying principles. The study findings support the notion that managers can apply these principles to improve employee motivation and commitment. This module focuses on district managers' responsibilities in the areas of training, coaching, and mentoring. This module describes the benefits of a diverse workforce, explores how a climate of diversity can be achieved, and encourages attention to the laws and regulations that help protect workers' rights.